CEO/President | M.A.T. Consulting, Inc.
Taming the Chaos in Your Organization to improve productivity and employee moral. As President of M.A.T. Consulting, Margie combines her management experience (since 1983) with her experience in training and facilitation (since 1993) to help organizations learn how to tame the chaos. Drawing from her degrees in Biology and Chemistry from Indiana University, she continues to study and work with the complex scientific processes of communications that make organizations thrive. She is a contributing author of the book is titled Real World Team Building Strategies that Work. •	Is one of less than 400 individuals worldwide that has received the Certified Professional Facilitator (CPF) designation from the International Association of Facilitators (IAF). •	Earned her Certified Training Consultant (CTC) from Ball State University. 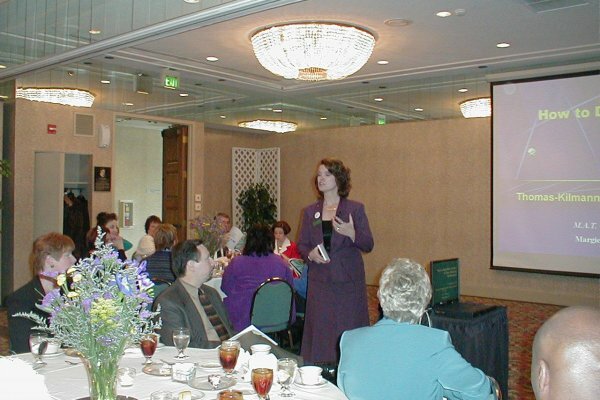 •	Authorized as a Myers Briggs Type Indicator Trainer and is an Inscape Publishing trainer and distributor. •	Certified Women Business Enterprise. •	Facilitated a multi-agency State of Indiana team that developed and implemented a Small Purchase Process. •	Communication and team skills trainer in government, manufacturing, not-for-profit, insurance, pharmaceutical, and other industries. •	Consulted, facilitated, and trained the City of Indianapolis’ Division of Compliance (now the Department of Code Enforcement) from 2002-2009 in implementing their “Service Delivery Plan”, reorganizing , and other improvement activities. •	Is a graduate of Indiana University with a double BA in Biology and Chemistry. This certification is managed by the International Association of Facilitators. The assessment process is based on rigorous peer review of knowledge, experience and demonstration of skills. The IAF Certified™ Professional Facilitator designation indicates attainment of these core competencies. The professional facilitator designation offers clients an assurance that those who are certified are qualified to design and provide basic group facilitation services. PCMA has identified top presenters from our 2009 Annual Meeting to be included in the Best in Class Program. An award presented annually to a women in Boone County, IN, for their continued volunteer service to the community. For participation in the Operation Planning Task Force Program. Authorized to present MBTI programs. ODI training to train facilitators. For successful facilitation of the State of Indiana Procurement Team. Given byt the National Environmental Performance Partnership Systems team, Indianapolis, IN for going above and beyond the call of duty in contributing to an exceptional team effort which lead to the FY98-99 Environmental Performance Partnership Agreement between Indiana Department of Environmental Management and the US EPA. Ball State University's Center for Organizational Resources will sponsor the Certified Training Consultant (CTC) Institute, designed to help people acquire effective consulting skills to work for corporations, government organizations and nonprofit businesses. Good communication is one of the most valued skills in the workplace. And effective listening is crucial to communicating productivity inside the organization and meeting the competitive challenges outside the organization. The Personal Listening Profileï¾® helps people become active, purposeful listeners in wide variety of situation for more productive communication. It is estimated that people screen out or change the intended purpose of what they hear in over 70% of all communications. The biggest factor contributing to such miscommunication is our listening approach. * Learn how different listening approaches impact listening and communication effectiveness. * Improve your ability to understand the purpose of different communications styles and use the listening approach appropriate to the situation. * Overcome listening barriers and capitalize on your listening strengths. Working With Angry People is a training program that provides you with the essential information and skills needed to help you deal with conflict in your personal and professional life. This program will help you respond to anger in others, especially when it's directed personally. You will understand how to manage your own anger, and you will learn to recognize and deal with someone who challenges a value such as fairness, trust, integrity, etc. You will also learn what to do when someone sees the facts differently than you. And finally, you will gain a basic understanding of how to manage conflict in others when you are in a third party role. Working With Angry People is designed for you to actively participate with your peers in the training workshop. This training program encourages you to improve your knowledge and skills by integrating your work-related situations into the workshop. * Working With an Angry Person. * Identifying Poor Responses to Anger. * Managing Your Own Emotions. * Using Key Listening Acknowledgments. * Dealing with Challenges to Values. * Resolving Differences in Facts. * Managing Conflict in a Third Party Role. Conflict is normal. This workshop provides a forum for participants to see through the fear, anger, and frustration of conflict to the opportunities and potential for constructive outcomes. The powerful Thomas-Kilmann Conflict Mode Instrument (TKI) model demonstrates that conflict-handling behaviors are neither good nor bad. Rather, conflict resolution is simply a matter of expanding skill sets and choosing the most effective conflict mode for a particular situation. * Identify the 5 different modes for dealing with conflict. Participants learn which is their prefered mode and when it might not be effect. * Learn the skills and approaches involved with each mode. Develop an awareness of the conflict modes of others. * How to choose the mode to fit the situation. Assess the conflict situation and choose the appropriate mode. Competing and conflicting interests have always challenged members of teams. What happens when the focus is on quick fixes instead of managing the complexity and nuances of interpersonal relationships? Teams fail. Learn how to manage the underlying conflicts for mutual solutions. Organizations have always known that success depends on people communicating effectively, contributing not only to the bottom line but to a positive performance environment. Successful organizations also know that good communication is not just about speaking well. It's about the quality of the connection between the senders and the receivers of the message. The strongest influence on the quality and outcome of all communications is the ability to listen effectively. Only by listening effectively can you respond appropriately. The Personal Listening Profile® helps individuals understand how to listen more effectively in a variety of situations. It is useful in many applications, including customer service, presentation skills, conflict resolution, and team building.